The patch for New Horizons' extended mission, which centers on a flyby of the object 2014 MU69 on Jan. 1, 2019. If you needed another reminder that a historic deep-space encounter is just around the corner, well, here you go. 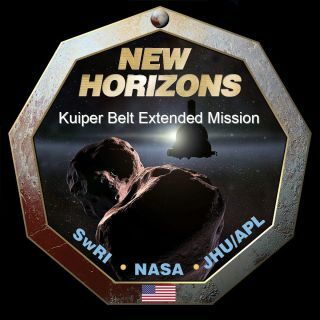 The handlers of NASA's New Horizons spacecraft have just revealed the official patch for the probe's extended mission, which centers on the flyby of a distant and mysterious object called 2014 MU69 on Jan. 1, 2019. "I think it's cool because it's very '2001'-esque," Stern, who's based at the Southwest Research Institute (SwRI) in Boulder, Colorado, told Space.com, referring to the classic film "2001: A Spacey Odyssey." "I think it has a nice sci-fi feel for a sci-fi target." The patch shows New Horizons zooming by 2014 MU69, which orbits about 1 billion miles (1.6 billion kilometers) beyond Pluto, in the ring of icy bodies known as the Kuiper Belt. That dwarf planet, of course, was the spacecraft's first flyby target: New Horizons famously got the first-ever up-close looks at Pluto, on July 14, 2015. You can't tell from the patch depiction whether MU69 is a single, multi-lobed object or two separate bodies. That design choice was intentional, Stern said, because either one of those descriptions might be accurate. MU69 is so distant and small — mission team members think it's a maximum of 20 miles (32 km) wide — that scientists haven't yet managed to nail down its true nature. The patch for New Horizons' original Pluto mission: The probe flew by the dwarf planet on July 14, 2015. The patch also shows a number of other small Kuiper Belt objects in the distance — a nod to the fact that New Horizons has been doing long-range investigations of many such bodies during its long cruise to MU69. And Pluto pops up in the design as well, tying the original and extended missions together: The dwarf planet's globe appears at the top of the patch, and New Horizons images of Pluto's terrain fill the border. But I asked Stern to confirm that interpretation, just to be safe. His response: "Damn straight."